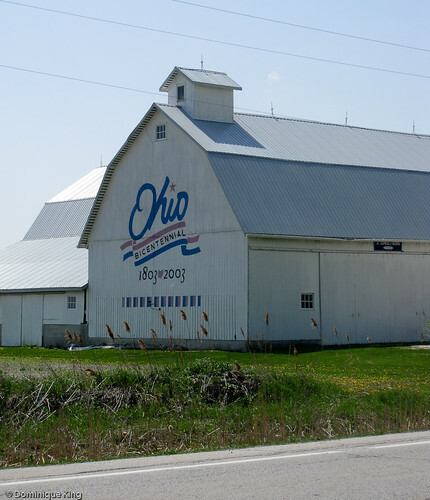 We recently drove by one of the Ohio Bicentennial barns along State Highway 2 between Toledo and Port Clinton. 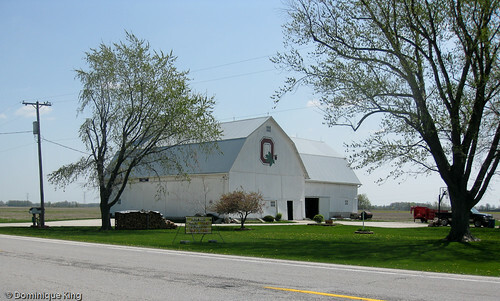 Ohio's Bicentennial Commission conceived the barn project as a unique way to advertise the state's 200th year as a state in 2003. Seven years later, this Ottawa County barn still stands as a reminder of the anniversary, and it got me wondering how many other Ohio Bicentennial barns are still standing. Scott Hagan was barely 20 years old when someone with the Ohio Bicentennial Commission saw a picture of a barn painted with an Ohio Buckeye logo, and the group began to consider a statewide project with barns in every one of Ohio's 88 counties painted with the state's bicentennial logo. The Buckeye-logo barn in question belonged to the Hagan family, and the son who painted their barn soon found himself with a new career as a barn artist. Scott Hagan lived near renowned Mail Pouch Barn artist Harley Warrick in Belmont County, Ohio. The young barn artist talked with Warrick, who taught him some of the secrets of the craft of barn painting before he died in 2000 at the age of 86. Hagan began the Ohio barn project in 1997, sketching each logo freehand before hand painting each barn. He painted the 88 barns, one in each county, plus a dozen more barns to make it an even 100 painted barns by late 2002. Hagan used 100 paintbrushes, 645 gallons of paint and put 65,000 miles on his truck as he traveled from barn to barn throughout those five years. And no two barns are exactly alike. This particular barn is actually the second barn painted in Ottawa County. A tornado blew through and destroyed the first barn when it was nearly finished. Today, Hagan estimates his painted barns as numbering well over 300 barns in 14 states. His new goal is to paint at least one barn in every state. Travelers who enjoy waymarking (a hobby similar to geocaching, except there is no physical cache involved) can record a find at this barn. Looking for more information about the project and surviving Bicentennial barns? Check out the Bicentennial Barns of Ohio Facebook page. Ohio's Bicentennial Barns by Beth Gorczyca, with photos by B. Miller or Bicentennial Barns of Ohio by Christina Wilkinson. I have a friend who photographs old barns and has said that they are increasingly more difficult to find. This one looks like it's in great shape. And glad to hear that there's a project created to appreciate them. Very cool! I'd never heard of this before. Thanks for sharing. Wanderluster-There are so many old barns in sad repair, or just falling down. We were just down in northern Ohio for a couple of days this week and saw lots of barns there that looked in nice enough shape to make good photo subjects. Wandermom & Jen-I thought this was a cool project when I first heard of it in the early 2000s. Fun to learn how Hagan is carrying on the barn artist tradition. By the way, we went looking for the Bicentennial barn in Ashtabula County this week...and the logo was no longer on the barn. Some of the barn owners apparently painted over the logo after their year-long contract was completed...while others left it up. This particular barn, and its logo, are in great shape! I like tis story too. about twenty miles from where I grew up, there were several old tobacco barns, being reclaimed by the woods these days. Kerry-It's kind of sad to see some of the old barns reduced to nothing more than a pile of lumber. We've driven past this particular barn quite a few times, and I figured I should finally get around to stopping and taking a photo of it. Perhaps he'd be interested in old New England barns. Gypsy-He probably would, considering his goal of painting a bar in each state. I think most of the ones he's painted so far have been in the Midwest (with the largest number of them being in Ohio. We lived in Ohio for three years, so the bicentennial logo and the Ohio State symbol on the other side look very familiar! Great idea for a post. Sarah-Glad you liked it! We've driven by this particular barn quite a few times, and I finally thought to stop and snap the photo because I always thought it was a great story.